"Toy theater", "berlin", "brookline", "facto teatro", "great small works", "living newspapers", "mexico city", "puppet showplace"
Int'l Toy Theater Fest at Puppet Showplace: Meet the Artists! Great Small Works was founded in 1995 by a collective of six artists, all veterans of Bread and Puppet Theater, who explore traditional popular theater and puppet forms to reflect contemporary life. Great Small Works performs in theaters, schools, parks, libraries, museums, prisons, street corners, and other public spaces, producing work on many scales, from gigantic outdoor spectacles with scores of volunteers, to miniature shows in living rooms. In curated festivals, cabarets and Soirees, Great Small Works collaborates with artists from varied traditions, provides performance opportunities for artists in diverse genres, and engages the participation of young artists in the process of finding their own voices. In community-based pageants and parades, the company works with groups of students, activists and artists to address issues of common concern. On any scale Great Small Works productions seek to renew, cultivate and strengthen the spirits of their audiences, promoting theater as a model for participating in democracy. Facto Teatro, "Don Chico con Alas"
Facto Teatro was formed in Mexico City in 2007 by Alejandro Benítez (actor and puppeteer) and Mauricio Martínez (actor and pedagogue). Facto Teatro seeks to create an interactive form of theater that will enable the audience to engage in its productions. The theater incorporates new forms of artistic discourse with a critical objective, allowing the public to enter into a form of entertainment free from prejudices and established formulas. The company's first work, Panteón de fiesta (Fiesta Graveyard), was commissioned by The Performing Arts Center of Los Angeles County for the 1st International Festival of Toy Theater of the Music Center of Los Angeles in June 2008. This commission was supported also by a grant from The Jim Henson Foundation. Since then, the company has performed at Teatro La Puntual, Barcelona, Spain (2009); Papiertheatertreffen, Preetz, Germany (2010, 2011); Teatr Grotesca, Krakow and Centrum Lowicka, Poland (2010); Great Small Works’ International Toy Theater Festival, Brooklyn, NY (2008, 2010); Rencontres Intenationales de Theatres de Papier, Pays d’Epernay, France (2011); and many festivals and theaters throughout Mexico. Mauricio Martínez, Co-founder and Artistic Director of Facto Teatro, studied Dramatic Literature and Theatre at the Faculty of Philosophy and Literature of the Autonomous National University of Mexico (UNAM). He has specialized in the manipulation of puppets for television, poetry, sound engineering and theater pedagogy, and has participated as an actor, director, adapter and sound engineer in over fifteen theatrical productions. In the field of education he works as a professor of theater, literature, movement and arts education in several schools in Mexico City. He has collaborated with the Ministry of Education as head of the Secondary School Theatre Program, which is part of the reform of secondary education by training teachers in theater across the country. Alejandro Benítez, Co-founder and Managing Director of Facto Teatro, is an actor, puppeteer and drummer. He studied Dramatic Literature and Theatre at the Faculty of Philosophy and Literature of the Autonomous National University of Mexico (UNAM). He took the improvisation workshop with the Latin American League of Improvisation and the training course with the renowned director and acting teacher Ludwik Margules. He has worked as an actor and studio musician and as a puppeteer has performed in theaters, television (the Latin American version of Sesame Street) and TV internet. Barbara Steinitz studied communication-design and illustration in Saarbrücken/Germany and Barcelona/Spain. After getting her diploma in 2004 she completed a voluntary service in Granada/Nicaragua; teaching workshops in arts and crafts for adults and children at the cultural institution Casa de los Tres Mundos, she started to explore and include puppet-theater within her work as an illustrator. In Nicaragua she got to know the author Gioconda Belli, for whom she illustrated her first book ("Die Blume und der Baum", Peter Hammer Editorial, Wuppertal 2006). 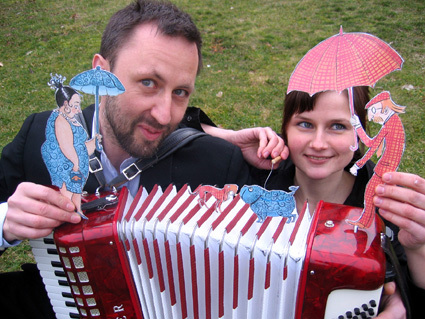 After writing and illustrating her own picture book “Schnurzpiepegal” (Bajazzo Verlag Zürich, 2009) she created a paper theatre show out of this book in collaboration with the musician Björn Kollin. In the last three years they have been been touring with this show in Germany, Austria, Switzerland, France and Mexico, presenting it in schools, libraries and theatre festivals. She received the Austrian Children’s Book Award, the Troisdorfer Picture Book Award and a nomination for the German Children’s Book Award. She lives in Berlin and works as a freelance illustrator, author and puppeteer. Björn Kollin 1998-2000 apprenticeship as a wood sculptor in Flensburg; 2000-2002 studies of audiovisual arts in Saarbrücken with professor Christina Kubisch, 2002-2004 studies of sculpture at the University of Fine Arts in Berlin with professor Tony Cragg, 2004-2005 master class student of professor Tony Cragg. Since 2005 freelancing composer, musician and artist, lives and works in Berlin. "Puppet showplace theatre", "Toy theater", "berlin", "brookline", "great small works", "international toy theater festival", "mexico city", "new york city", "paper theater", "puppets"
I first attended a show at the Puppet Showplace Theatre several years ago, when my then-six-year-old niece was visiting Boston. I was dazzled, both by the skill of the puppeteer—the enthralling Sarah Lamstein—and the candid absorption of young audience members. They beamed at the arrival of a friendly kitten puppet, shrieked at onstage silliness, and cringed when a tiny Beelzebub rose up from behind the curtain. Afterward, a few children stayed to “meet” one of the puppets; they held its small hands and spoke to it as if to a new friend, apparently oblivious to the presence of Lamstein. Since then I’ve also discovered PST's offerings for adult audiences, which have included some of the most memorable and ingenious theater productions I’ve seen anywhere. A troupe from Bavaria, Saltamontes Puppet Arts, enacted a mysterious tale with bunraku-style animal figures; Vermont’s Modern Times Theater used cardboard cutouts in a droll retelling of a political fable by Herman Hesse; recently, a marionette puppet slam blew my mind with wood and string. I have noticed that in the presence of puppetry arts I can be as awed and credulous as any six-year-old. Right now I’m particularly excited about a traveling show that will be landing at PST at the end of this month: The Great Small Works’ International Toy Theater Festival. After a residence at St. Ann’s Warehouse in Brooklyn (how’s that for a credential?! ), the traveling part of this year’s festival will make a stop at PST, on June 28 and 29. Both nights will feature a cabaret-style production by three acclaimed theater companies. I'm really looking forward to seeing their work in the intimate space of PST. Facto Teatro (Mexico City) will perform “Don Chico con Alas” (Don Chico with Wings), based on a surrealistic story by Mexican author Eraclio Zepeda. Barbara Steinitz and Björn Kollin (Berlin) will use live music—and a suitcase for a stage—in“Schnurzpiepegal” (Like Master, Like Dog), a humorous meditation on urban life and human-pet dynamics. Great Small Works (New York, but founded by veterans from Vermont’s Bread and Puppet Theater) will bring together words and images from modern-day media in “Living Newspaper,” a new work that addresses the issue of American gun violence. Never fear: kids will have the chance to get in on the toy theater fun, too. On Saturday, June 29, PST will host two daytime shows of “Schnurzpiepegal” (Like Master, Like Dog), each followed by a free workshop, where artists Barbara Steinetz and Björn Kollin will help children create their own toy theater puppets. Evening cabaret on Friday, June 28, and Saturday, June 29, at 8 p.m. (Recommended for adults and teens 13+.) Tickets: $15 General Admission/$13 Members. Cash bar. Family matinee on Saturday, June 29, at 10:30 a.m. and 1:00 p.m. (Recommended for ages 3 & up.) Tickets: $12 General Admission/$8 Members. Followed by a free puppet-making workshop; PST will provide materials.